From blacksmithing to basketry, from weaving to woodturning, we have an incredible range of heritage craft skills in the UK and some of the best craftspeople in the world. But many of these skills are in the hands of an ageing population. In 2015, the Heritage Crafts Association received a grant from The Radcliffe Trust to assess the vitality of traditional heritage crafts in the UK and identify those crafts most at risk of disappearing. The assessment of the vitality of each craft – from those which are currently viable to those which are critically endangered – has been made with the help of craftspeople, craft organisations, heritage professionals, funding bodies and members of the public who contributed to the research. For the purposes of this research, a heritage craft is defined as ‘a practice which employs manual dexterity and skill and an understanding of traditional materials, design and techniques, and which has been practised for two or more successive generations’. The research focuses on craft practices which are taking place in the UK at the present time, including those crafts which have originated elsewhere, and on those aspects of each craft with a high reliance on hand-work and which involve high levels of hand skill. 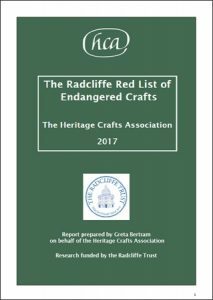 In May 2017 the HCA published The Red List of Endangered Crafts, the first research of its kind in the UK. This research has enabled the HCA to shine a light on this important aspect of the UK’s collective intangible heritage that has, until now, been languishing in the dark. It is our hope that this research will act as a call to action to those who have it within their power to resolve or alleviate these issues, and that this project will mark the start of long-term monitoring of heritage craft viability and a shared will to avoid the cultural loss that is borne each time a craft dies. In March 2019 a major update was published, increasing the number of crafts examined to 212, with one new extinct crafts, 16 new critically endangered crafts and 20 new endangered crafts added. 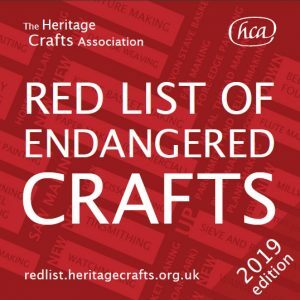 Click here to view the Red List crafts by category of risk – alternatively, you can search for a particular craft by using the search bar on the right. Click here to download the publication accompanying the 2019 edition. Click here to download the original report of the research. If you have any queries about the research, are aware of a heritage craft that is not listed, or have further information to add about any craft, please contact redlist@heritagecrafts.org.uk.